For much of its length, the Curonian Spit is about two to three kilometres wide; at points it narrows to just a few hundred metres. The sea is never far away. There is a real sense of being on the very edge of Europe. Yet, for all its remoteness, the landscape is deeply influenced by human intervention. It is an extraordinary thing to travel. A real privilege, a blessing even. We have made journeys these past months which have taken us from the Outer Hebrides to the Carpathians, from the Alps to the Baltic, where this week we have been staying on the Curonian Spit. The Curonian Spit is a very special place, a 97-kilometre-long finger of land which runs north-east from the seaside town of Zelenogradsk towards the point where the waters of the River Neman decant into the Baltic at Klaipeda. On the west side of the Curonian Spit is the Baltic Sea, on the east there is a vast lagoon fed by the Neman. The Curonian Spit is a place where geography matters. It is a vulnerable landscape shaped by wind and waves. Scale is everything. 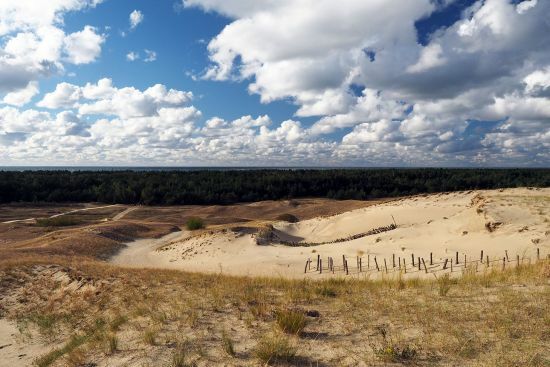 There are big Baltic skies and broad horizons, but the real appeal of the spit is in its details: the sand that skims off the crest of a dune and the tiny plants that struggle to survive in the parched, sandy soils of the spit. Tawny pipits shelter from the sting of the wind, while foxes and elk search for food. For much of its length, the Curonian Spit is about two to three kilometres wide; at points it narrows to just a few hundred metres. The sea is never far away. There is a real sense of being on the very edge of Europe. Yet, for all its remoteness, the landscape is deeply influenced by human intervention. Survival here has required adaptation. One community shifted location thrice in three centuries, each successive move prompted by advancing sand dunes which threatened to engulf the houses of the village. There's little surviving evidence of the kursieniki, the early inhabitants of the spit who fished for their living. Wind and sand are no friends of the archaeologist and there are few traces of early settlement. The human interest lies in the extraordinary history of the Curonian Spit over the last 150 years. It was industrious Prussians who in the late 19th century first started afforesting the spit, a process which didn't appeal to Romantics who favoured the eerie Curonian dunescapes. Marl and sludge were taken from the lagoon and huge teams of workers, many of them women, toiled on the dunes to plant young trees. The taming of the Curonian Spit has not left it devoid of interest. On the contrary, the planting of the forests brought stability but there are sufficient remaining areas of bare dune to still impart a sense of open wilderness. No surprise perhaps that the protagonists of the German expressionist art movement known as Die Brücke found inspiration in the Curonian Spit. The village of Nida, midway along the spit, flourished as a haven for artists. And German ingenuity is recalled elsewhere on the spit. There was an important ornithological research station run by German scientists, and two gliding stations where aviation pioneers soared with the Baltic winds. Yet history has not been kind to the Curonian Spit. German influence in the region was abruptly cut after the Second World War. The Germans of Nida moved away. The entire spit was in the Soviet Union, the northern half administered by the Lithuanian SSR, while the sector south of Nida was run by the Russian SFSR. That division is reflected today with an international frontier bisecting the spit at its midpoint: Lithuania to the north and the Kaliningrad Oblast of the Russian Federation to the south. But everywhere there is the shadow of the former German province of East Prussia. The Curonian Spit was never a destination for mass tourism. But over the years it pulled artists, writers and a monied elite who could afford a visit to this extraordinary landscape. German visitors typically approached the spit from the south via the Sambia Peninsula (now part of Russia). And that was the way in which we first visited the spit. But this week we took the ferry from Klaipeda to the northern tip of the spit. Arriving by boat gives a quite different impression, almost as if one is arriving on an island. And for Lithuanians that's just what the Curonian Spit is. A fragment of the country detached from the mainland, a place apart, a kingdom of the sea. There are those in Lithuania who would bridge the Nemunas Estuary, so making it a matter of moments to drive from Klaipeda to the spit. But that, we feel, would destroy the very magic of the place.